Assassin's Creed: Rogue is coming to PC in early 2015, as confirmed to IGN today. You play as Shay Patrick Cormac on a revenge spree in the frozen north atlantic. We'll have a chance to catch up with (read: stab) some familiar characters, including Haytham, Assassin's Creed 3's sole source of charisma, and Adéwalé from Assassin's Creed 4. It looks like the boat vs. boat action of AC4 will feature heavily, and locations will reach beyond the icy northern regions to more tropical climes. 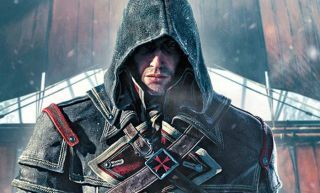 Assassin's Creed: Unity, set during the French revolution, has been grabbing all the limelight ahead of its November launch, but Rogue offers the enticing opportunity to play as a Templar. According to the new story trailer, that means an instant upgrade to a much cooler coat. It's due out in November for PS3 and Xbox 360. Will the PC version be an upgraded version released alongside PS4 and Xbox One editions? For now Ubisoft are saying the delay is "primarily for production reasons."